The Wright Brothers Plane... The Machine that Changed the World! By unleashing the Magic of Aviation, the Wright Brothers plane has earned a very special place in the heart of all aviation enthusiasts.By proving to the world that controlled manned-flight was possible, the magic of aviation was unleashed with a vengeance! This magic quickly ushered in the vintage aircraft of the World War One era followed by the powerful warbirds that changed the course of history in World War Two. Less than 50 years after the first flight of the Wright Brother's Plane, Chuck Yeager broke the sound barrier in 1947. A mere 22 years after that, Neil Armstrong and Buzz Aldrin were walking on the moon! Orville and Wilbur became interested in aviation at a very young age when their father bought them a rubber powered toy that resembled a helicopter. This helicopter-like toy was designed by a French aeronautical pioneer by the name of Alphonse Pénaud back in 1878. The Wright Brothers called it that "bat". Amazingly enough, this very same toy is still available today! The Wright Brothers began their adult careers very early on, without even obtaining high school diplomas, by designing and building their own printing press for their weekly publication of West Side News published in their hometown of Dayton Ohio. They opened their very own bicycle shop a few years later. The Wright Brothers interest of aviation never faded since playing with that little toy from their father. Around the turn of the century there was fierce competition to see who could build the first "flying machine". 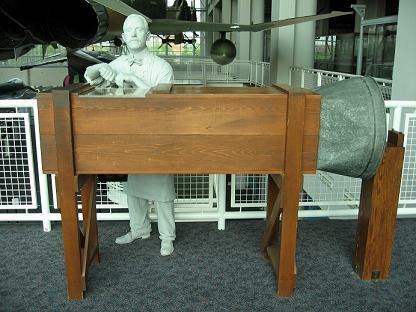 Believe it or not, the Wright Brothers' plane wasn't the first contraption to fly. 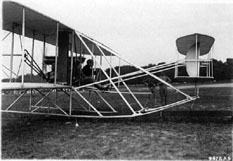 Samuel Langley flew an unmanned steam-powered aircraft back in 1896. But what good is an aircraft that flies off a ramp and drops into the Potomac River like a rock! Earlier aviators such as Otto Lilienthal and Percy Pilcher built and flew gliders in their pursuit of manned-flight. Both of these gentlemen lost their lives to out of control gliders. The Wright Brothers learned from these failures and seemed to be the first to truly understand the importance of "controlled flight". While other aviators where focusing on aircraft with more power, Orville and Wilbur focused their efforts on how to control an aircraft. They turned to Mother Nature by studying the flight of birds for the solution! By studying how birds change the angle of their wings in order to roll to the left or right, they figured that an aircraft could be controlled in the same manner by "wing warping". After proving this theory of wing warping by attaching control lines to twist the sides of a box-kite while in flight, they decided to build a glider that incorporated wing warping. The lift calculations used to design the wings of their fist couple of gliders were primarily based on Lilienthal's experience with gliders. They placed a horizontal control surface, the elevator, in front of the main wings. They didn't see the need for a rudder at this point. The wing warping to control roll didn't exactly work out like they hand planned either. They were the first to discover adverse yaw affect. In other words, when they tried to turn right, they would roll right, but the plane would actually turn left! Their first couple of gliders were discouraging to say the least, but the Wright Brothers weren't the type to give up. It was back home and back to the drawing board. It was time to build a wind tunnel where they would test hundreds of wing shapes and models to make sure their next glider would have the lift they needed. They also added a rear vertical "fixed" rudder to counter act the adverse yaw affect. The third glider actually had enough lift to glide fairly well, but the rudder they added didn't work out so well. While the new rudder took care of the adverse yaw effect, it unfortunately made it nearly impossible to recover from a turn. Orville had the perfect solution. A movable rudder! They used cable to tie the control of the rudder into the control of the wing warping. 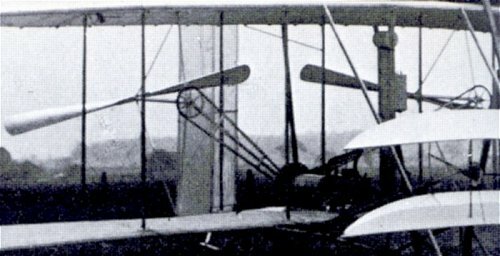 When the wings were warped to roll, the rudder would automatically deflect in the opposite directly. And there you have it, three axis control of an aircraft! The basis of the Wright Brothers Plane and virtually all present day aircraft! Only a few years passed after the invention of the Wright Brothers plane before ailerons became the primary method of controlling roll. There were a few vintage aircraft of the WWI era to use wing warping to roll. But ailerons proved to be more practical and they don't fatigue the structure of the wing as wing warping does. After many successful attempts with the glider, it was time to add power to the Wright Brothers plane. Back in those days propellers had only be used to power boats. Since water behaves a lot differently than air, Orville and Wilbur's first task was to come up with a propeller specifically designed to move air. They thought of a propeller as nothing more than a rotating wing, so they used their wind tunnel to help them design the first airplane propellers in history. They were pusher props and were pretty darn efficient too, even by today's standards! 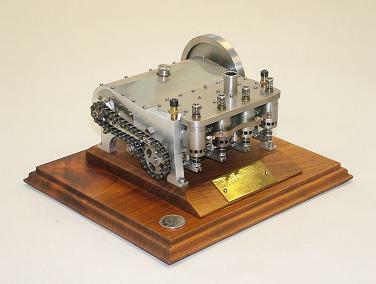 Since they couldn't find an engine light enough to provide the power needed, they turned to their bicycle shop mechanic Charlie Taylor to custom build a lightweight aluminum engine. This engine was connected to the pusher props on each side of the Wright Brothers plane by a heavy duty chain. The brothers journeyed back to Kitty Hawk and built a set of rails for the plane to roll on to build up speed before lift off. On a cold windy morning on Dec 14, 1903 Wilbur climbed aboard the Wright Brothers plane for that first historical flight that lasted all of 3 seconds before stalling and hitting the ground! Three days later after minor repairs, Orville gave it a try and kept her in the air for 12 seconds for a total distance of 120 feet. Wilbur and Orville both flew twice that day with Orville's last flight taking the cake... He managed to fly for 59 seconds for a distance of 852 feet. Now they were getting somewhere! 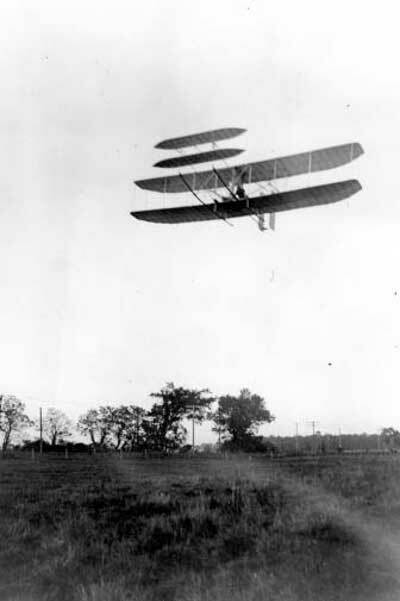 The brothers built the second Wright Brothers plane the next year in 1904 , this time the decided to fly near their home in Dayton rather than make the trip to North Carolina. A farmer let them use his field just few miles out of Dayton called Huffman Prairie, adjacent to present day Wright-Patterson Air Force Base! They developed a weighted catapult system and used longer rails to assist in getting the new Wright Brother plane airborne. With tons of practice, persistence, and a lot of rebuilding; the brothers managed to fly a little bit longer and farther as the summer passed. By September of that year Wilbur managed to fly a complete circle! They built a third Wright Brothers plane to fly the summer of 1905. This time the rudder could be controlled independently from the wing warping. 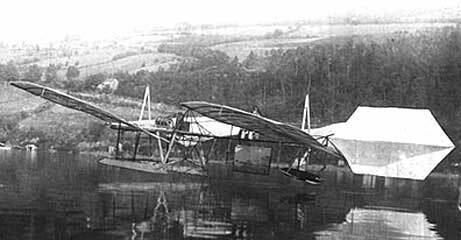 This was the first airplane with true independent control on all three axis. Midway through the summer they made the rudder and elevator control surfaces large and farther away from the wings. 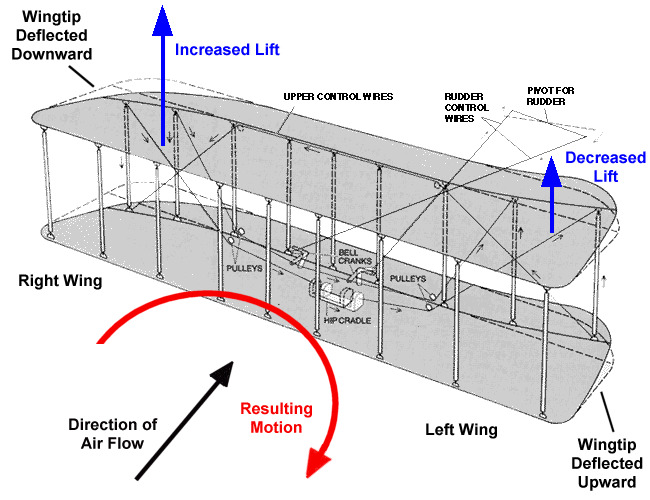 The latest changes made the Wright Brothers plane much more stable which allowed them to stay in the air pretty much as long as they wanted to. The Wright Brothers were very secretive about their work. They just created the first flying machine for crying out loud, and they didn't want some "Joe Schmo" to steal their idea and get rich from it! Sure, there were reports of this flying machine of theirs. But most people just thought they were full of it, and the Wright Brothers liked it that way. They sent letters to United States government trying to sell their aircraft, but the brothers refused to fly the aircraft in order to prove that the Wright Brothers Plane could indeed fly. They were reluctant to even share pictures! Keep in mind that he U.S. government just paid a "prestigious scholar", Samuel Langley, a ton of money to demonstrate how his steam-powered aircraft could plummet into the Potomac River. 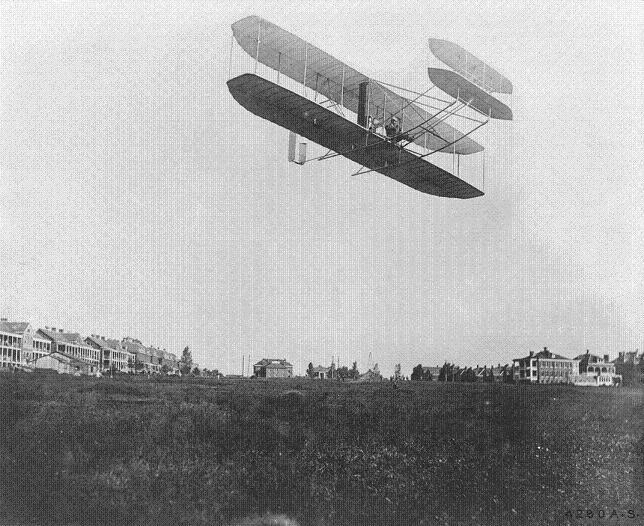 The Wright Brothers were finally issued a patent for their flying machine in May of 1906. 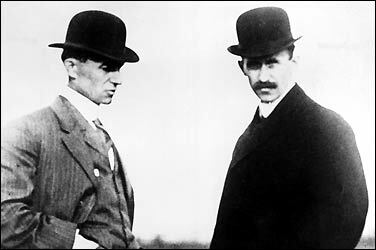 However, the brothers refused to fly the Wright Brothers Plane for nearly 2 while they pursued a buyer for the invention. Finally, in 1908, the Wright Brothers signed contracts with both the U.S. Army and French governments which required them to take-off, fly and land their aircraft with a passenger on board. Equipped with seats and levers for controls, Wilbur made history on Aug 8, 1908 in Le Mans, France by proving to the world that the Wright Brothers plane could really fly. The Wright brothers instantly became known around the world as the brothers from Ohio that created the first flying machine! Nearly a month later on September 3rd, Orville made his public demonstration to the U.S. Army in Fort Meyer Virginia. A few days later he took a passenger on and hour long joy ride!